Ominous clouds gather over the wave-battered coast of the North Sea. Under the constant threat of storm and flood, the hard-working folk of this region must decide between rallying together to build dikes that keep the rising tide at bay or to pursue their own self-interest. 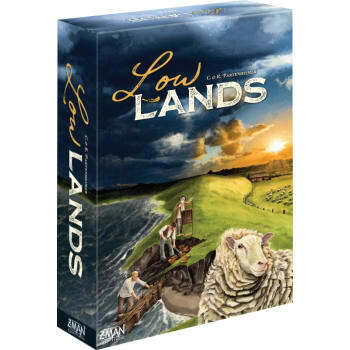 Take up the challenge and carve your farm out of this rough landscape In Lowlands, a game of farm-building and varying agendas for two to four players. During every game of Lowlands, you and your fellow players each develop your own farms by breeding sheep and building improvements. But powerful storms threaten to sweep away your flocks and cut into your profits. Only by contributing to the dike can you ensure the safety of your farm. Those who strike a delicate balance between selflessness and self-interest thrive is this harsh environment.